Haptic feedback technology does not easily follow the trend of miniaturization. Electrical muscle stimulation (EMS) can close the gap between exoskeletons and vibration motors to deliver a wide range of tactile and force feedback. It is currently difficult to apply EMS in prototyping, as it requires in-depth knowledge and skills about hardware, software, and physiological characteristics. To simplify prototyping with EMS we present Let Your Body Move ToolKit, a toolkit for haptic prototyping in mobile and wearable situations. WARNING! USES OF EMS CAN LEAD TO PAIN, INJURY OR TO DEATH REGARDING KNOWN AND UNKNOWN DISEASE OR WRONG USAGE. BE ALWAYS AWARE WHAT YOU ARE DOING AND FOLLOW CAREFULLY THE SAFETY INSTRUCTIONS. WE ARE NOT RESPONSIBLE FOR ANY SIDE EFFECTS OF USING EMS, THE DESCRIBED HARDWARE OR THE SOFTWARE THAT IS DESCRIBED IN THE REPOSITORY. THE TOOLKIT IS DESIGNED FOR RESEARCH AND NOT FOR HOME OR REGULAR USAGE. THE PARTS THAT WE LISTED ARE NOT FOR MEDICAL USAGE. ALL USAGE OF THE TOOLKIT AND ITS COMPONENTS IS ON YOUR OWN RISK! The system is not built for resell/retail or for any commercial reasons. It is only built for scientific research prototyping. If you do NOT know or understand how the system works, do NOT use it! Electrical muscle stimulation (EMS) also known as functional electrical stimulation (FES), neuromuscular electrical stimulation (NMES), transcutaneous electrical nerve stimulation (TENS or TNS) uses small current that is applied to the user’s body to stimulate skin receptors and muscles fibers. When the current crosses a muscle it lead to an artificial muscle contraction that results in a viable and perceptible movement. There are several known and unknown risks that come along with the usage of EMS and there are things that you NEVER should do! The electrodes should NEVER be placed on the front torus near the heart. EMS devices should NOT be used in combination with a pacemaker or by people who have any heart disease, known or unknown. It is strongly recommended that pregnant woman, people with epilepsy, with cancer, after a surgery, with sensitive skin, or with a skin disease should NOT use EMS, or only after consulting their personal doctor. Read carefully and follow the safety instructions of the EMS devices that you are using to generate the EMS signal and do NOT use it in other ways. Wrong EMS parameters, defective hardware or software errors can lead to pain, injuries or even to death. Moreover, EMS signals can stimulate the nociceptors (pain receptors). The pain threshold of the stimulation depends on the user and on the position of electrodes. Therefore, the maximum EMS level should be calibrated individually, for each placement and each usage. Never manipulate the intensity of the EMS device without testing first the signal step by step and stay ALWAYS in a comfortable level. Software or hardware errors can easily lead it the maximum EMS level that you have calibrated. Reports from medical and fitness domain have shown that long activation periods with high EMS levels can result in muscular fatigue and overtraining of the actuated muscle. Additionally, no long-term studies about regular EMS use are yet available. Do NOT over use EMS for a long time in a row. This hardware is NOT medically tested, therefore we used off-the-shelf EMS devices as signal generators. Never use any other kind of current generation than medical tested devices. Furthermore, we give no guarantee nor hold responsibility that these systems work safely together. We tested the software and hardware in several workshops, tutorials and user studies in short session up to one hour. In this cases the hardware worked reasonably. When you build your own hardware follow VERY carefully the instructions and test all hardware and software extensive before connecting it to your own body. Again, the parts that we are listed are not for medical uses! They have a high tolerance and we separate the control circuit from the EMS circuit galvanically, but high current can still break though or shot cuts could happen. Using EMS on the human body leads also to ethical questions regarding (1) safeness and (2) self control. (1) EMS should be never used with people that do NOT know or not understand the safety issues and how EMS works. All people that are using this technology should do it on free will and should NOT be pressured to use it in any ways. Researchers should always take care about the physiological and psychological stage of users in particular, using such an immersive and intrusive technology like EMS. Always follow the Ethic in HCI, the SIGCHI and the American Psychological Association guidelines. However, running EMS experiments typically requires the approval of the local ethical board. (2) Remote control of users in a physical way, such as let them perform gestures or change the walking direction, opens novel ways of human computer interaction but also new ethical responsibility to researcher. You should always keep mine for what purpose this technology can use and what purpose should be clearly excluded. Therefore we added to the MIT Licence a non-military use paragraph. However, this does not release you as researcher from the responsibility of using the EMS feedback technology only for good cause. WE PRECLUDE THE LIABILITY FOR ANY USAGE OF THE EMS TOOLKIT THAT INCLUDES ALL HARDWARE AND ALL SOFTWARE COMPONENTS YOU FIND IN THE REPOSITORY. WE POINT OUT RISKS AND SAFETY ISSUES THAT ARE KNOWN AND UNKNOWN USING EMS ON THE HUMAN BODY. WE ARE NOT RESPONSIBLE FOR ANY AND ALL INJURY, DISABILITY, DEATH, OR LOSS OR DAMAGE TO YOU OR OTHER PERSONS USING THE TOOLKIT. THE USE OF THE TOOLKIT AND THE COMPONENTS IS FULLY ON YOUR OWN RISKS. THE PARTS WE DESCRIBED IN THE TUTORIAL ARE NOT PROOFED FOR MEDICAL USE. THE OFF-THE-SHELF DEVICES ARE NOT MADE FOR USING THEM WITH OUR HARDWARE. IF YOU NOT KNOW WHAT YOU ARE DOING, DO NOT USE THE TOOLKIT! Make sure you follow the safety instructions before using it and are familiar with all the procedure of how to apply EMS safely. If you are NOT familiar with EMS, start to read the work below. Note that the control board of the toolkit does not generate any EMS signal, it is an amplifier that can only applies the power of the signal you input. Please pair this board only with medically compliant EMS devices (check regulation in your country) and verify that you plug it in the INPUT port marked in the board. The OUTPUT port is connected to the electrode pads. Please use EMS electrodes (wet, pre-gelled and approved electrodes). Test EMS without the control module first. When you are familiar with EMS, test with the correct connected control module. Follow the getting started instructions. The following tutorial is divided into four sections. The first section describes some basics about EMS and how to get the resources for the following sections. Section two describes how to build your own EMS-Toolkit-Hardware, which you can see in the pictures above. Section three introduces the Arduino software for the hardware module and describes how to install and test it on your manufactured toolkit control module. Section four shows a set of sample apps which use the Toolkit. These sample apps can be used for further development and prototyping. If you already have an EMS-Toolkit as well as the resources and know how EMS works, you can start with section three. For safety issues, read the manual of your EMS/TENS device. It should explain things like when you should not use EMS/TENS, locations of the skin where electrodes should not be placed and electrical parameters of your EMS/TENS device. For a deeper understanding we recommend the following books: Centofanti, S.K. Application of Muscle/Nerve Stimulation in Health and Disease. In Springer Netherlands, Dordrecht, 2008, 69–116. Kilgore, Kevin L. Implantable Neuroprostheses for Restoring Function. 2015. Clone the repository or download the content and put the files into an arbitrary empty directory, here called <your created folder>. We provide the following resources to build your own EMS prototyping system. All resources are described in the corresponding Wiki article. Licensed under "The MIT License (MIT) – military use of this product is forbidden – V 0.2". Some rights reserved. See at License. 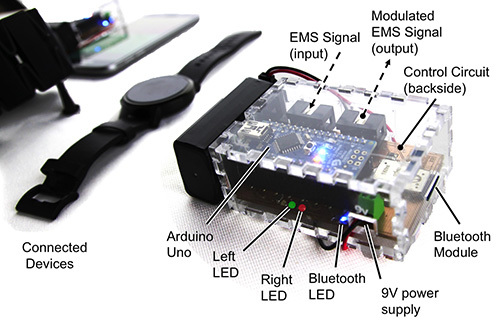 If you are using this prototype for research, cite the following paper: M. Pfeiffer, T. Duente, M. Rohs: Let Your Body Move: A Prototyping Toolkit for Wearable Force Feedback with Electrical Muscle Stimulation, coming on [Mobile HCI 2016] (http://mobilehci.acm.org/2016/). 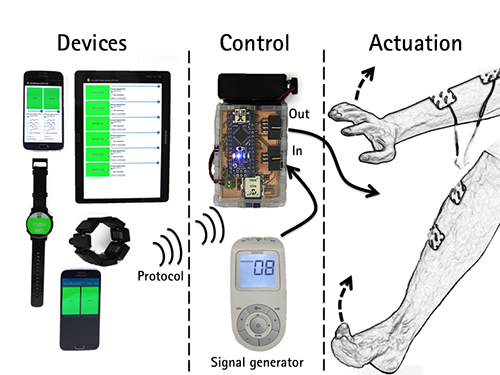 Here you will find an overview of the toolkit, typically used EMS parameter and muscles that worked reasonable in prior projects: M. Pfeiffer, T. Duente, M. Rohs: Let Your Body Move: A Prototyping Toolkit for Wearable Force Feedback with Electrical Muscle Stimulation, coming on [Mobile HCI 2016] (http://mobilehci.acm.org/2016/).